Jonny and Alistair Brownlee on their way to silver and gold at the Rio Olympics. I have friends who participate in triathlons and ironman competitions, grueling three-stage events of swimming, cycling and running so alien to the ways in which I can or desire to spend my free time, that I can only silently wonder – Are these guys from a different planet? Alas, triathletes are earthlings like you and me. They are just far more focused, obsessive, competitive and determined about swimming, cycling and running than I am. When I learned that Alistair and Jonathan (Jonny) Brownlee, two brothers from Yorkshire, England, won gold and silver respectively in the triathlon at the 2016 Rio Olympics, I took notice, wondering if the fact that they were brothers helped them to the podium. In fact, this is the second Olympics in a row that the Brownlee Brothers made it to the podium, with Alistair winning gold and Jonny bronze in the London Games. I learned they are indeed different, not so much that they diverge from homo sapien anatomy and psychology, but that they differ from me by significant degrees. I came across this site entitled “11 Traits of Top-Notch Triathletes“, which showed me that while I may be a tad measure better than some on these traits, I am leagues behind triathletes in all of them. We can deftly balance a jam-packed schedule. We are maxed out on self-discipline. We’re laser-focused about our goals. We take goals one step further. Pain management is fun for us. We welcome obstacles, adversity and pressure. We’re in love with our sport. We are competitive, both with ourselves and others. We love to share our knowledge and convert our friends. We know that it takes one to know one. 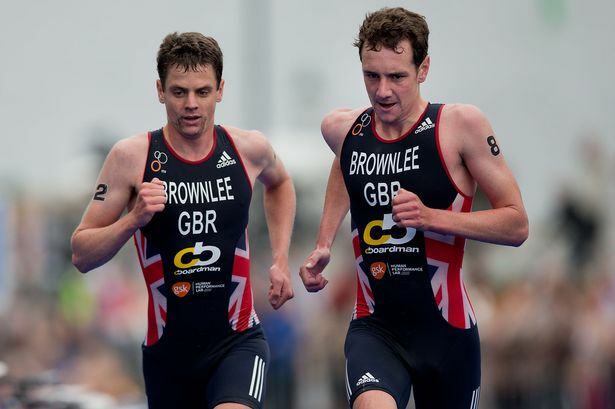 So, is there any advantage to the Brownlee’s being brothers? The answer, as Alistair related in this Yorkshire Post article, is yes. We both know how important we have been, pushing each other on over the years. From everything, to just motivation to get out of the door in the morning – if you know your little brother is going to go training you are going to go training, too – to being able to travel the world together. That has been really important over the years. Over the last three months we have done almost every session together, even the very hard sessions where we are pushing each other as hard as we can. There is no-one else in the world that can do that with each other, but we have done that time and time again, four or five times a week in the last three months, and that has been absolutely crucial. Posted in Other Olympics, Rio Olympics, Swimming, Track and FIeld and tagged 2016 Rio Olympics, Alistair Brownlee, Brownlee Brothers, ironman, Jonathan Brownlee, Jonny Brownlee, triathlon, Yorkshire. Bookmark the permalink.